We Made. We Hacked. We Played. I invited a small group of our Western Massachusetts Writing Project to my home yesterday for a Make/Hack/Play session. These are folks on our WMWP Tech Team. Along with great conversations and connections, we got down to making, hacking and playing. First, we used paper circuitry to think about scientific discovery, writing and map making. Everyone created their own map — either literal or metaphorical or symbolic — and then we created a paper circuit board to light up the important nodes on our maps. Second, we dove into Webmaker’s Popcorn Maker to create video projects. I shared the one I did, using the I Have A Dream speech with overlays, and a few other folks also tinkered with social justice-themed video projects. It was a blast and for my visitors, the paper circuitry and Popcorn Maker were relatively new experiences (one of the Tech Team folks had participated in a paper circuitry session at another WMWP event.) I’m grateful to have colleagues who would give up part of Saturday to make/hack/play and think about learning in new and interesting ways. What did you make today? You can always remix my I Have a Dream video. Just click remix and dive in. This morning, I have a small group of folks from our Western Massachusetts Writing Project Tech Team (which I lead as as the co-director of technology for WMWP) coming over to my house to do a Make/Hack/Play session. We’re connecting together over coffee to play around with paper circuitry first — we will be making “maps” (metaphorical or literal) that we will light up “nodes” of interest. Then, we will shift over to Webmaker’s Popcorn Maker for remixing of video and media. My hope is that we will use MLK’s I Have a Dream speech as the center and then layer in media on top of or inside of the video. My friends have not ever used Popcorn, so I am curious to see how best to guide them into it. This small group work will also help me and a WMWP technology team colleague think about an upcoming presentation at a WMWP Spring Symposium, where we are facilitating a session around student agency with media and technology. She teaches a college course on using media and I am leading the hands-on portion, where folks in the session will be using Popcorn for remix. Today is the sixth annual National Day on Writing, sponsored by the National Council of Teachers of English and various partners (like the National Writing Project) and this year’s theme is Writing Your Community. I’ve been mulling over how best to do this, and decided that mapping out communities — either literally or metaphorically — made a lot of sense. 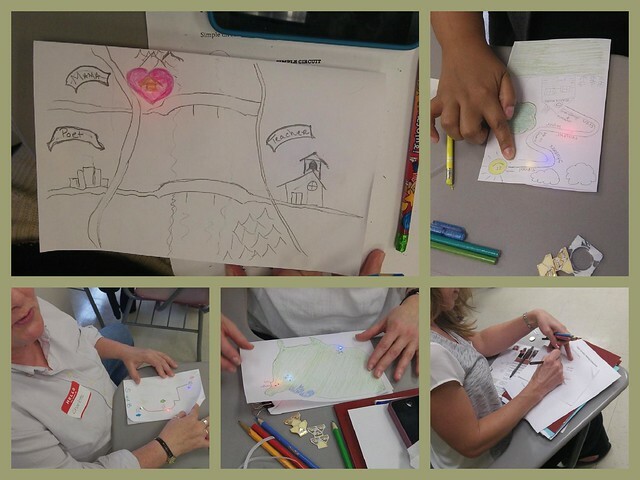 Check out this workshop that I led at our Western Massachusetts Writing Project this weekend, in which we played around with paper circuitry to illuminate nodes on maps of our communities. This workshop was part of our annual Best Practices conference, and the group of teachers were highly engaged in this hands-on activity around transforming notebooks with circuits and lights. We had a blast yesterday as our Western Massachusetts Writing Project Summer Institute took part in Hack Your Notebook Day. I was the facilitator of our WMWP session but the educators in our institute were the Makers, and Make they did. 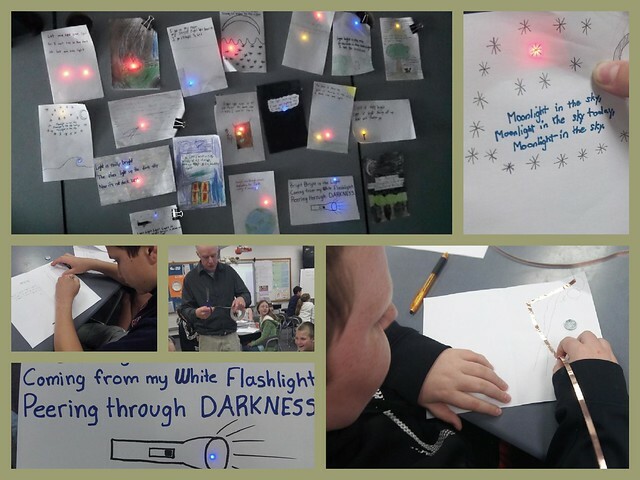 Using paper circuitry, they illuminated poems, short prose, scientific ideas and even more with LED sticker lights, conductive copper tape and a round watch battery to give their writing power. Creating a cultural heritage map, where students’ family origins are “pinned” with light to the world map itself, giving a visual representation of cultures. I like all those ideas, and it showed a thoughtful approach to the work we did yesterday, if you can call it work. It was more like play, and we had that moment where the very last piece lit up (after some minor repairs and reconfiguring) and knew we had achieved success on Hack Your Notebook Day. 21st Century Notebooking with Inside/Out from NEXMAP on Vimeo. 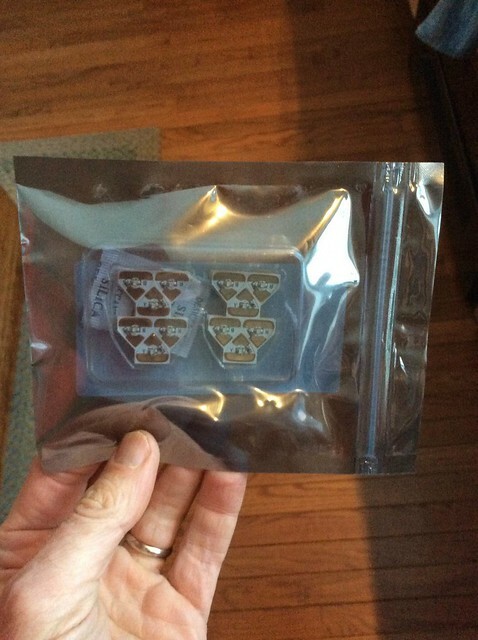 Our WMWP site is participating, as we purchased an entire paper circuitry kit so that we can dive right into the topic. I’m a little nervous, because although I have done this activity with my students (see my post over at Middleweb), I have not yet had the chance to meet the Summer Institute folks, nor have I had a chance to see the entire package of materials in front of me. 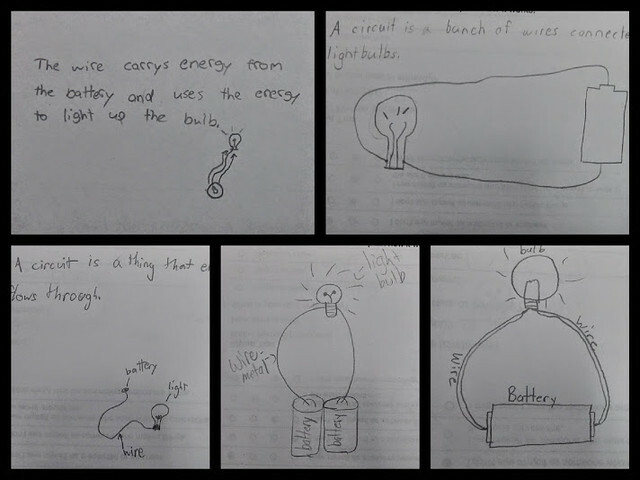 Start off with a blind question: draw a simple and parallel circuit on a notecard. We’re activating knowledge here about circuit design. Reflect: What have you learned? What are applications for the classroom? I’ll be doing some sharing of how things went. I’ve been meaning to try my hand at another Teaching Kit via Mozilla’s Webmaker community, and a call for kits from Teach the Web this weekend finally got me going. After mulling over some possibilities, I decided that developing a kit around paper circuitry would keep the ideas and experiences from a pilot program flowing. I am leading a workshop at our Western Massachusetts Writing Project this summer on this topic (part of a Hack the Notebook Day in July), so I want to keep what I did with my students in the front of my mind as much as possible for when I work with other teachers at our writing project. 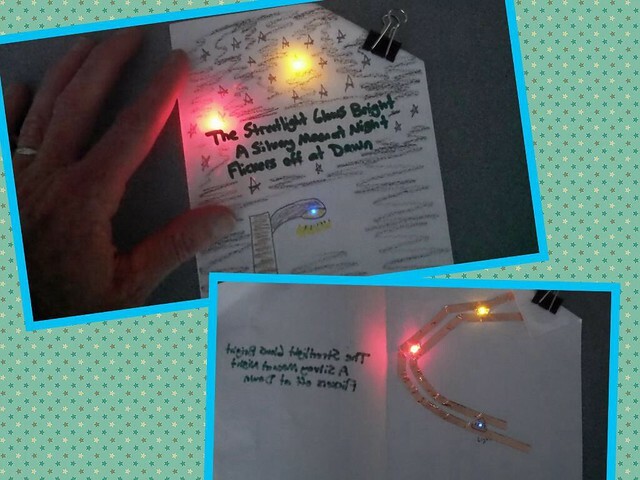 Check out the Illuminating Poetry with Paper Circuitry kit that I created this morning. Remix as needed. 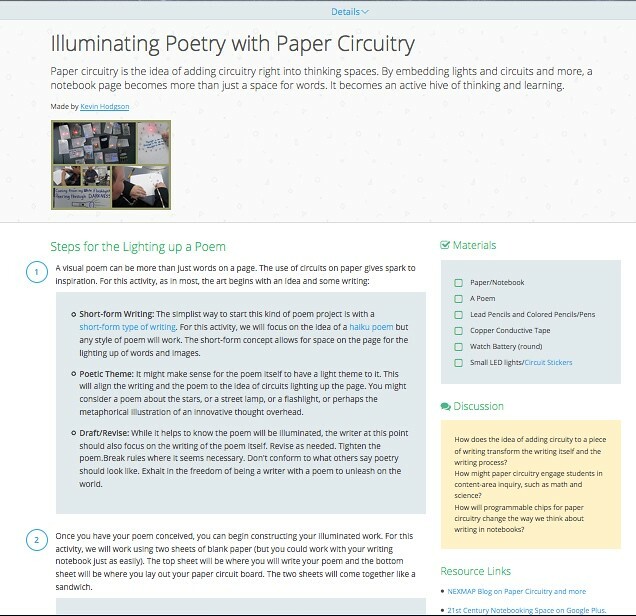 At my Working Draft blog over at MiddleWeb, I wrote about our work in the classroom with light-themed illuminated poetry and paper circuitry. 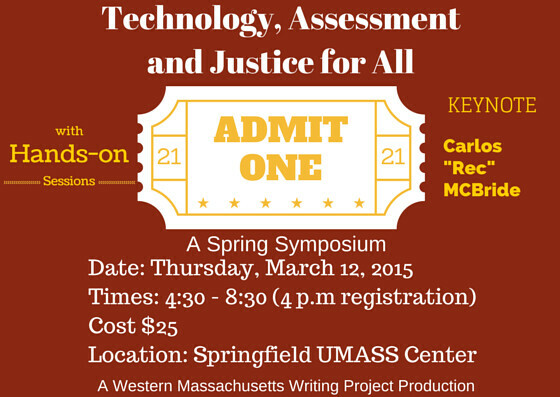 I invite you to read my observations of my students working with circuits and writing. It was pretty interesting. I am going to write more about this later, but here is a collage of our pilot paper circuitry project from yesterday, in which we “illuminated” light-themed haiku poems. The lesson revolved around using copper tape as the circuit wires, with LED stickers situated beneath the poem and pictures to create a lit-up scene to go with the poems. I am very fortunate that I am able to do a small pilot project with my sixth graders using ‘Paper Circuitry‘ — a process that embeds circuits and LED lights into notebooks. The idea is to illuminate writing (literally) and also to pull together the concepts of the scientist/inventor notebook with the writing notebook in interesting ways. Thanks to my fifth grade colleagues, many of my sixth grade students had a pretty decent grasp of circuits going into this pilot. We’ve since done some mini-lessons around circuits as a way to keep the idea in their minds. Then, last week, students wrote a bunch of haikus, with at least one having the theme of “light” somehow. This was intentional, of course. This week, they worked on creating a final version of the haiku, with folded paper. The front side is the poem (sort of like a greeting card format) and the inside will be their paper “circuit board” where we will use circuit tape (although I am amped — ahem — for the future of conductive pens where what you write becomes the “wire” of the circuit — so cool!). Although I have done some paper circuitry in a workshop at the DML Conference with Jennifer and David, from NexMap (which works with a researcher out of MIT who is developing the process) and Paul from National Writing Project, I wanted to try a parallel circuit (instead of the simple circuit) because I know some students want multiple lights in their poem project. And it worked! (After I watched some videos, learning from the Internet, of course). You can see my poem, inside and out, in the image above. 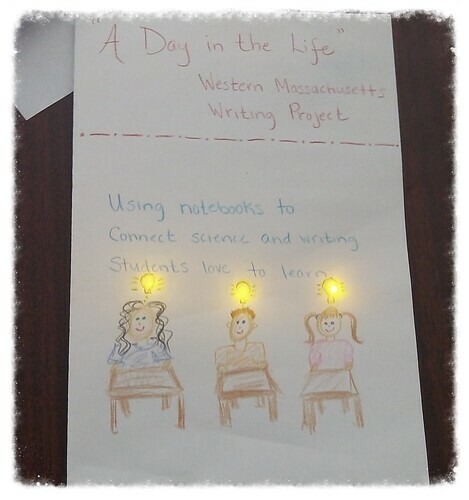 I’m also excited because our Western Massachusetts Writing Project is going to be participating in a Hack the Notebook day in July, using paper circuitry with teachers who will be in our Summer Institute, and some folks beyond, to play around with science and writing, and the connections between the two. I hope to document today’s work with students (and maybe get a few student projects as samples) as something to share in July. I’m still trying to figure out how to display the poems in my classroom when they are done, because the battery makes the weight of each one a little tricky. But I have parents using my room for a meeting and it would be pretty nifty to have the illuminated poems all lit up with student works, right?